On Saturday, October 27th, at the Museo del Ciclismo, Madonna del Ghisallo, the largest collection of Maglie Rosa (pink jerseys) was inaugurated. 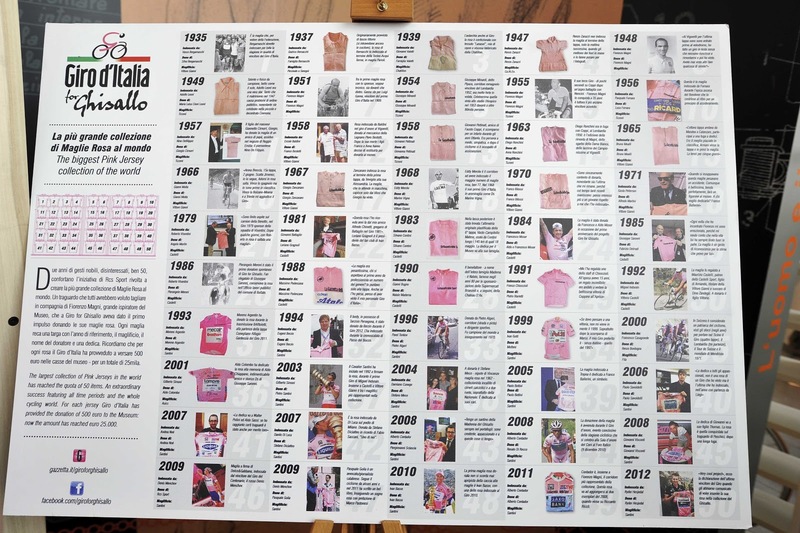 A two year effort on the part of the Giro d'Italia and RCS Sport has resulted in reaching fifty pink jerseys from different years now collected and on display at the museum. 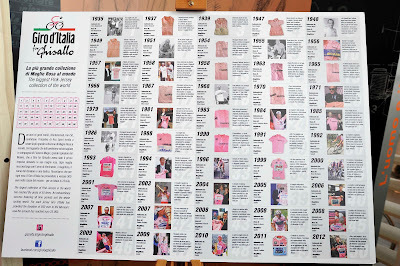 The goal is to collect one jersey for each of the seventy seven editions to date (Learco Guerra was the first to wear the pink jersey of the Giro d'Italia when it was introduced in 1931). The Museo del Ciclismo, Madonna del Ghisallo, is a fantastic museum that every cyclist visiting Italy should visit. The famous chapel of "Madonna del Ghisallo" is next door, and of course, a must visit as well. A new book was also announced, “Magni, il terzo uomo” by Auro Bulbarelli; more details in a subsequent blog post. I have a list of Cycling Museums in Italy here; any additions are welcome. Stories for the Italian Cycling Journal about rides, granfondos, touring, having a good time cycling in Italy, Italian cycling history, racing, etc. are always welcome. Contact me at veronaman@gmail.com. There are more than 2,600 stories in this blog. The search feature to the right works best for finding subjects in the blog. There is also a translate button at the bottom so you can translate each page. 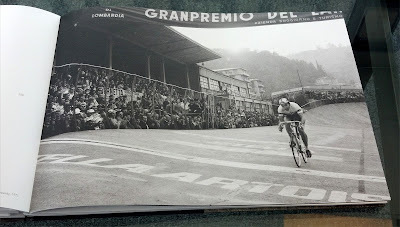 Remember the now famous 50th anniversary Campagnolo gruppo (pictured above; more photos here)? To celebrate it's 80th anniversary next year, Campagnolo was founded in 1933, the company will be issuing an 80th anniversay gruppo. Details are scant but the early word is that it will be available in the Super Record level, mechanical version. There will be 2,013 gruppi availabe plus 2,013 pairs of anniversary wheels. Five newspapers, including the Gazzetta dello Sport, published a manifesto today in their editions for "credible cycling". The other newspapers are L’Equipe, The Times, Het Nieuwsblad and Le Soir. More than 400 riders have been disqualified or involved in doping investigations since the 1990s. We are a group of newspapers in five newspapers from four different countries (Belgium, Great Britain, Italy and France). 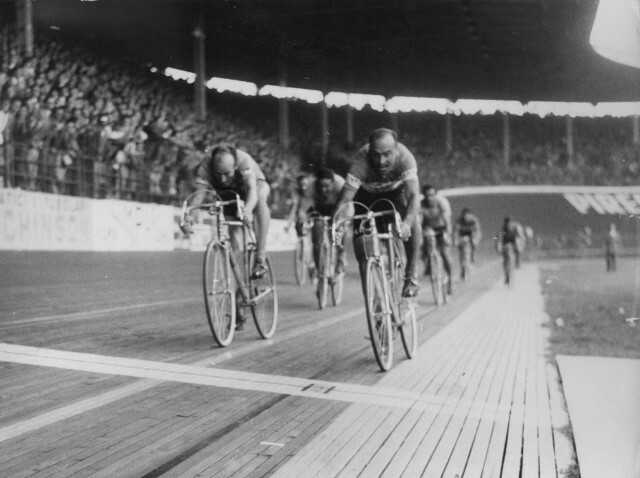 We’ve been part of the history of cycling for over a hundred years. We passionately love this sport and strongly believe in its future. However we are very concerned about the current situation. The long list of doping scandals that have clouded the horizon of cycling in recent years now includes the Armstrong case, the confessions of several of his former teammates, the report of the American Anti-Doping Agency (USADA): that as points its finger at the malfunction or even complicity of the International Cycling Union (UCI).There are also disturbing reports filtering from the Padua investigation and the Operacion Puerto trial begins in Madrid in January. This recent revelations show clearly that there was sick ‘cycling system’ and we can no longer put our faith in the UCI or the team managers who were complicit in the cheating. However responsibility lies with everyone in the cycling family: governing bodies, management, sponsor, organisers and athletes. It seems that things have improved recently. We believe in the new generation of riders but we believe it is impossible to continue with the same structure, the same rules and the same people. - That the UCI recognizes its responsibilities in the Armstrong case. - The creation, under the responsibility of the Agency (WADA), of a neutral and independent commission to investigate the role and responsibility of the UCI in the Armstrong case and the fight against doping in general; to report errors, abuses and possible complicity. - That the organization of controls at the biggest races is directly by WADA and the national anti-doping agencies. - That the suspensions for serious doping cases are more severe and that teams pledge to terminate contracts and not sign for a further two years any athletes suspended for more than six months. - The restoration of the ‘gentlemen's agreement’ that allowed the temporary suspension of riders involved in a doping investigation. - A stronger involvement and accountability of the title sponsors of teams. - The reform of the WorldTour, its points system and licensing, which remains closed and opaque. We propose that the licences are no longer awarded to the managers but to the sponsors. - The organisation of a major ‘cycling summit’ before the start of the 2013 season in order to define the new organization and new rules. We sincerely hope that the cycling world will seize the opportunity to make fundamental reform. Sarto Cycles, the handmade in the Veneto framebuilder, has opened a new section on their website named the Sarto Boutique. Here you will find unique builds that they offer for sale. The first, seen in the photographs above (click to enlarge), is a Kilogrammo frameset with custom paint, equipped with Campagnolo Record EPS, Fast Forward deep profile carbon clinchers, and other goodies. For more and better photos, and details, visit Sarto Boutique. "My priority is the Giro d'Italia. It's become apparent that it's very difficult to compete in two grand tours and so it's very likely I'll be there [in the Tour] in a helping capacity, supporting Chris Froome." Note: Should Wiggins win the Giro d'Italia it would be a first for Great Britain. The inclusion in the Giro next year of a 53km individual time trial, unusually long for the race and Wiggins' strongest suit, makes it even more attractive for him. "It’s a well balanced route, but it’s going to be wide open right to the end, and the final stages will be really spectacular. It’s going to be great for the fans because the end of the Tour will be at altitude. We’ll have to see, but I think it’s going to be very uncertain. It’s Froome I fear the most, he’s very dangerous in the mountains and he was the strongest climber this year." "The hundredth edition of the Tour de France is more difficult than the 2012 edition but still much less than so many other editions in which I participated. I think it is a tour within the reach of many, one that offers something for everyone, including us. There are opportunities for the sprinters, the climbers, in the team time trial which is always spectacular, and some stages are suited to a long breakaway. The race design does not benefit the chronoman as it did last year, nor does it favor climbers.The start in Corsica makes everything harder. It's not a classic first week of flat stages, in the second and third stages the riders will face some pretty good climbs. Whoever is racing for GC will have to arrive 100% ready in Porto Vecchio. The three Alpine stages will be very difficult, it starts with a double-Alpe d'Huez climb and followed by stages with finishes of Le Grand-Bornand and Semnoz. I do not see the Mont Ventoux stage being particularly decisive but it will be certainly beautiful." "Apart from the first stage, which is not particularly difficult, the other two in Corsica are particularly challenging and this for the Tour can be an advantage because maybe there will be fewer crashes and less nervousness. I think the time trial will be less decisive for the overall ranking compared to other years, at least on paper, because the team time trial is only 25 km and the other two are not 50-55 km. In in my opinion will be the most decisive stages will be the mountaintop finishes, especially those of Mont Ventoux and the Alpe d'Huez." "Now I know the parcours of the Giro and the Tour. Once I see the Vuelta's I will decide which two grand tours I will participate in." The route of the 100th Tour de France was unveiled this morning at the Paris Convention Centre in front of an audience of 4,000 people. 21 stages covering 3,479 kilometres (before final ratification). The first three stages, taking place in Corsica, will be road stages with the first time trial, a TTT, scheduled for stage 4. 10 new stage towns: Porto-Vecchio, Bastia, Ajaccio, Calvi (Corsica will welcome the Tour for the first time), Cagnes-sur-Mer, Saint-Gildas-des-Bois, Saint-Pourçain-sur-Sioule, Givors, Chorges, and Annecy-Semnoz. For the first time in 10 years the Tour will not leave France's borders. Mont Ventoux will be re-visited for the first time since 2009 on stage 15, with Mont Ventoux coming at the end of the longest stage of the edition at 242 km. There will be a double (!!) ascent of Alpe d'Huez on stage 18. Wilier Triestina has been committed to creating bikes at the very highest level for decades. We are convinced that the numbers are proving us right. There are many investments made to ensure the best quality for those who demand the most, and it is with this in mind that in recent years we have continuously implemented and improved the existing test protocols and testing of our products. There are however no tests which guarantee the total exclusion of error. Sometimes, unfortunately, even the tightest controls cannot avoid a certain percentage of defects. It is with deep sorrow that we inform you that some of the forks for the Izoard XP model shipped from Wilier's factory between October 1, 2011 and October 19, 2012 are potentially defective. Wilier Triestina is therefore announcing a voluntary precautionary recall to verify and ensure the safety of your Izoard XP bicycles. Therefore we ask you to discontinue use of your Izoard XP until a check is completed. We apologize in advance for any inconvenience this recall may cause. All Izoard XP bicycles that shipped from the Wilier Triestina factory October 22, 2012 and afterward are guaranteed and safe in every respect. RISK: The use of Izoard XP set up with the fork in question could result in a failure. In certain circumstances, the occurrence of such failure could cause the rider to fall, with potentially serious consequences. DESCRIPTION OF THE DEFECT: Some of the Izoard XP forks in question were built outside of our specifications and have a thinner aluminum steerer tube than the standard. INSTRUCTIONS TO VERIFY: If the bike was purchased after October 1, 2011, please discontinue use of the bike immediately. You must verify the soundness of the fork by checking its serial number. To do this, please visit your Wilier retailer, who will disassemble the fork and check the serial number for you. Cinelli is hosting a presentation for riders that are interested in participating in the 11,718 km Tour d'Afrique bicycle expedition and race from Cairo to Cape Town next year. This year there were four Cinelli "Racing Rats" models used in the event. Cinelli is preparing a new Bootleg model (the Race Rats fall under the Bootleg line) that will be used in the event. Cinelli will also be auctioning a Hoy Hoy Rats bicycle to support the Tour d'Afrique Foundation. The Tour d'Afrique features 94 cycling days or stages, averaging 123 km each, broken up by 25 rest days and 2 days of ferry boat travel for a total of 121 days in traversing Africa from north to south. 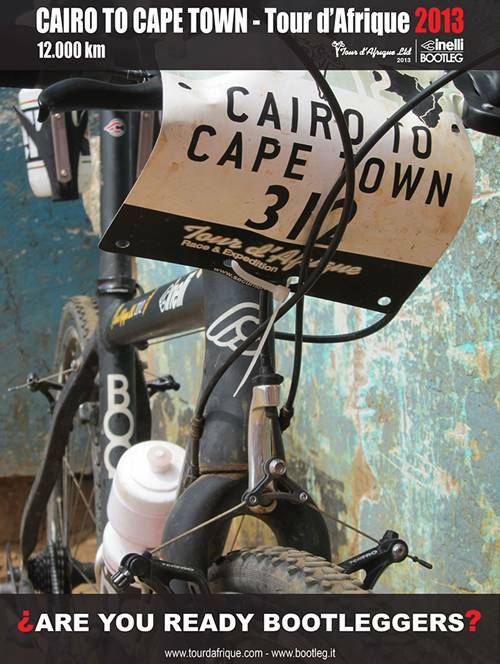 Stages range from 80 km on rough terrain to more than 180 km on the best paved roads. In summary, the route will challenge you physically and mentally like no other - and reward you with scenes of unsurpassed splendor and an incomparable feeling of accomplishment. Traveling through 10 countries in all, you will cycle along the Nile past ancient temples, through the Sudanese desert, and up and down the biblical landscapes of Ethiopia's rugged Simian Mountains. After crossing the Equator in Kenya, you will pedal past legendary Mount Kilimanjaro, to Lake Malawi, Victoria Falls, and along the edges of the magnificent Kalahari and Namib deserts, en route to the finish of your epic journey in beautiful Cape Town, South Africa. We published the following story in December, 2010, when Magni was celebrating his 90th birthday. “Laugh and the world laughs with you; Weep, and you weep alone" wrote American poet Ella Wheeler Wilcox. A thought that could be used to briefly describe the philosophy of life of Fiorenzo Magni, the "Lion of Flanders", who today celebrates his 90th birthday. He will celebrate his birthday at his home in Monticello Brianza (Lecco) surrounded by the affection of his family: his beloved wife Liliana ("I married her in 1947 after only six months of courtship and now after 63 years together I still love her as the first day that we met"), the equally beloved daughters Tiziana and Beatrice, the two son-in-laws, and five wonderful grandchildren. "In my life I have faced many difficult times but always managed to find the positive side of every situation, I have never been overwhelmed by the difficulties I encountered. To face any problem with optimism is a great lesson for everyday life and for me it was also true regarding my long sporting career." This is the first reflection of Magni, who now also tells us what it's like to feel in his nineties: "I am proud to be 90 years old in good health and my mind still bright, but sometimes it makes me feel strange to find myself in conferences which, looking around, I find to be the oldest of the participants. Unfortunately, I think about how long my life will last. All in all my life has been been very happy and rewarding, even as I set out to the next goal of 100 years years old....". A great cycling career, from the "terzo uomo" (third man) after Coppi and Bartali, during the golden age of Italian cycling to the approximately 160 wins including 3 Giro d'Italia, 3 Tour of Flanders(which earned him his nickname), 3 Italian Championships and 3 Tour of Piedmonte. "The most beautiful victories for me were the 3rd ones in the races which I was most fond of: the Giro, Flanders, and Piedmonte and the Italian championships, 3 is the perfect number .... ". Magni's career spanned twenty years from 1936 to 1956. An enviable result, built with persistence over many years of activity in which Magni has dueled with opponents and enemies of various types, but during which he also built strong bonds of friendship such as with the great Alfredo Martini. "We met on the occasion of my first races in 1936. In my first major placement, a 2nd place, I finished behind a race in suburbs of Florence that Alfredo won. From then arose a great mutual respect between us, a friendship that has never known friction or crisis that has lasted until today. In 1939 we were teammates in the AC Montecatini and later we found ourselves among the professionals and competed for many years. Alfredo was an unparalleled tecnico (commissario tecnico of the Italian national squad). And poor Franco Ballerini, a young man that I appreciated very much and whose early death gave me a deep pain, I thought him a a worthy heir to the leadership of the Italian national cycling professionals that I've had the honor to lead." The story of how "Lion of Flanders" chose a career in cycling is interesting. "It was a choice in life that was almost obligatory. My father Joseph, a big, tall, man with Herculean strength had a stable of horses which transported materials of various kinds between Prato and Valle del Bisenzio, earning some good profits and assuring my mother Julia and all our family a well-off life. In the late '30s, when my father was only 47 years, he was hit by a car in Prato (which was engulfed in fog) killing him instantly. I, who had already won the championship of Tuscany for amateurs, concluded in 1937 that cycling could become a rewarding, and financially feasible, job for me. So, with great sadness we decided to sell her beloved horses and the family business." Magni's racing debut was not too favorable, "The first race was at Incisa Valdarno in 1936 but I fell and I retired. In the second race I was suffering from a puncture, but in the the third race came the first victory. Among the amateurs I won twenty or so races and met opponents that would become friends such as the montecatinese Gino Fondi, romano Quirino Toccaceli, pistoiese Serafino Biagioni, romagnolo Vito Ortelli and, of course, Alfredo Martin." Magni shared the joy of his third and final victory in the 1955 Giro d'Italia with Alberto Martini against a hapless Gastone Nencini. 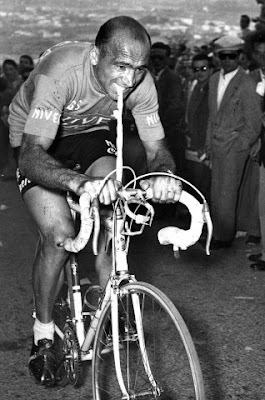 With two stages remaining in the race it seemed that Nencini would be the winner of the 1955 Giro. Magni recounts, "I was not resigned to defeat and in the evening before the Trento stage (the third to last)I began to study the course at the hotel. I studied the course village by village, from Trento to San Pellegrino, and saw that there was a descent that was dangerous with a pebbled surface. It was what I was looking for and I said to myself, "Tomorrow I will escape right there!" This caused a skeptical reaction from Martini, my trusty teammate on the Nivea squad. But the next day, things went as I expected and I won the Giro there. Coppi won the stage, and I regretted having won the race against a very good young and emerging Tuscan as Nencini. Two years later, on the Leo-Diesse Chlorodont squad, I had the satisfaction of being able to contribute in good measure to the ultimate success of Nencini in the 1957 Giro. Fiorenzo Magni is merited with having brought the sport's first, true sponsorships: "At the end of 1953 there was a major crisis caused by the arrival of the first motorcycles which threatened bicycle manufacturers such as Bianchi, Legnano and Ganna for which I competed. So, I had the intuition to try to change the regulations that at the time prevented non-sports companies from sponsoring teams and athletes. This struggle, to change the regulations, lasted three months and I benefitted from the important and unconditional support of the unforgettable President of the FCI Adriano Rodoni and great journalists such as Guido Giardini, Mario Fossati, Dante Ronchi, and others. At the same time I had successfully undertaken negotiations with the Swiss family of Zimmermann, owners of Nivea. At the beginning of 1954 Nivea entered triumphantly into cycling, marking the end of an era and the beginning of a modern view of sports sponsorship. My victorious battle, of which I am proud, also proved very useful to the sponsorship of other sports such as soccer and basketball." Today cycling has changed further as to its relationship with the media: "I do not want to go into the fight against doping, I am displeased to encounter certain situations. In my office I keep different photographs: in one Martini and I are together in 1939 with our shirts of AC Montecatini and seem to be two young boys. The other is a reproduction of a page of Gazzetta dello Sport with a big group photo at the 1951 Giro; I am immortalized with Coppi, Koblet, Bobet, Kubler, Van Steenbergen and Bartal and Bartali. Below the photo you see a headline, written in rather small letters, which says "Al Milan lo scudetto tricolore" (the tricolor champions). 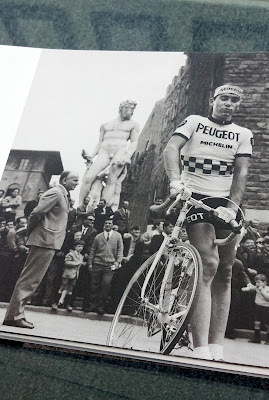 Unfortunately, times have changed since then .... "
Today, Magni follows only the Giro d'Italia and the Tour de France. He expresses some opinions gladly about current riders: "I like Nibali a lot, he is a boy with a certain future, a man who will be our point of reference in stage races. But how does one go downhill so fast with a physique so thin? Obviously he has great courage. However, I also respect Ivan Basso very much." This week the the city of Monticello Brianza has inaugurated the exhibition "I 90 anni del Leone" (the "90 years of the Lion") which will run until December 18th. The exhibition will have the two bikes on which Bartali won his two Tour de France, Coppi's hour record bike, and bikes of Merckx, Baldini and others. "Magni was the ‘third man’ during the golden age of cycling, of Coppi and Bartali. He won the Giro d'Italia 3 times and was known as “The Lion of Flanders” (“Il Leone delle Fiandre”) for his 3 consecutive wins in the ‘classic of the North’, the Tour of Flanders. Italian sport is in mourning once again. Fiorenzo Magni, one of the all time greats of cycling, the ‘third man’ of the golden age of the sport in Italy after Coppi and Bartali, who thrilled a nation at the turn of the Second World War, has died. He would have been 92 on December 7. Only a week ago he was at the presentation and launch of a book that had chronicled his deeds. It was inevitable. There is no point beating about the bush: sooner or later it was going to happen. And it happened just as he was about to celebrate his 92nd birthday. But, to us, to all of you, to everyone, it seems that we all die much sooner. By now we had all come to believe that he'd been blessed with the gift of eternal life. 92 years: almost an eternity, but just the blink of an eye. But, from today, it’s official: we are all orphans. 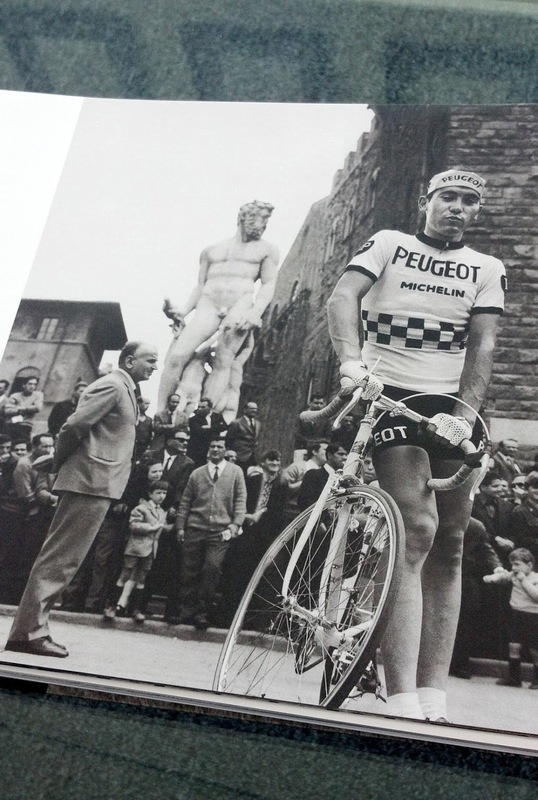 Now we can truly utter the words: Fiorenzo Magni was cycling. The notion of cycling when it just meant bicycles. Men on bicycles. Races on bicycles. A time when cycling and racing was at the centre of the world: News Year’s Day coincided with the Milano-Sanremo and Christmas with the Giro di Lombardia. In between there was the Giro d’Italia, the Giro of France (Giro, not Tour!). Followed by the World Championships. Between Christmas and New Year we’d all go to the track. It was a different world. Honest and consistent — The notion that cycling was an escape, first from misery and then from poverty. That it was always better than having to toil in the fields or in factories. Cycling was a hunger as well as abstinence. Adventure and exploration. The history of Italy and of Italians. And that notion that no matter what, forever, no one would ever be able to describe the feeling and put it into words in a single lifetime. Fiorenzo Magni was cycling as he lived and breathed the sport: a rider, a sporting director, a coach. He had been the president of the riders association as well as the president of the Italian Cycling Federation. Then an honorary consul and international ambassador. A veritable planetary authority. A supreme font of knowledge: he’d listen to everyone carefully - and would immediately know who was right or wrong. His cycling was a religion. A mission. A passion. In a word: love. Often thwarted by Bartali and Coppi, Magni did nothing but thank them: he would say that, without those two, he would have been a nobody. They made him a man. But, the exact opposite it true: it was Magni who kept their memory alive and extolled their glory. History has also shown that the real pink jersey belonged to him: born in Tuscany, he moved to Monza, he was the epitome of the romanticism of cycling coupled with the common sense of industrialism. Wisdom and balance. Integrity and cohesion. And the far-sightedness of someone who knows, or who thinks or who pretends to be on the periphery of it all. Mellowed — But, as time went on, he mellowed and his sometimes touchy and irritable character became ‘tamer’ and even ‘sweet’. But his never lost his air of authoritativeness or authority. So much so that his requests would in some way often become an order – but without us realising it. It was a pleasure, no, an honour to have met Fiorenzo Magni. Luckily, as Magni lived to such a ripe old age, it was a privilege, no, and honour, for lots of other people too. Now, it would only seem fitting that Magni’s funeral be held at Ghisallo, the location of the Museum of Cycling, his museum, as only he would have been able to create it in such a soulful place. It was an even more arduous task than his three Giro d’Italia wins, his three Tour of Flanders wins, his three Italian titles and all the races he ever won put together." Photo: Magni at 1956 Giro d'Italia; 1956, Fiorenzo Magni: During the 12th stage, Grosseto-Livorno, of the Giro d'Italia Magni crashed on the Volterra descent. He broke his collarbone but finished. At the hospital he is told, "Best you return home." Magni decided to continue racing. The next day is a rest day followed by a time trail stage Livorno-Lucca, the Lucca-Bologna stage and the uphill time trial stage Bologna-San Luca. Before starting Bologna-San Luca, Magni knows that that on an ascent he cannot pull on the handlebars. His mechanic, Faliero Masi, cuts a piece of a tire tube and attaches it to the handlebar so Magni can get leverage. It works. Magni after crashing the next day and breaking his shoulder went on to finish 2nd in Milan behind Charly Gaul. 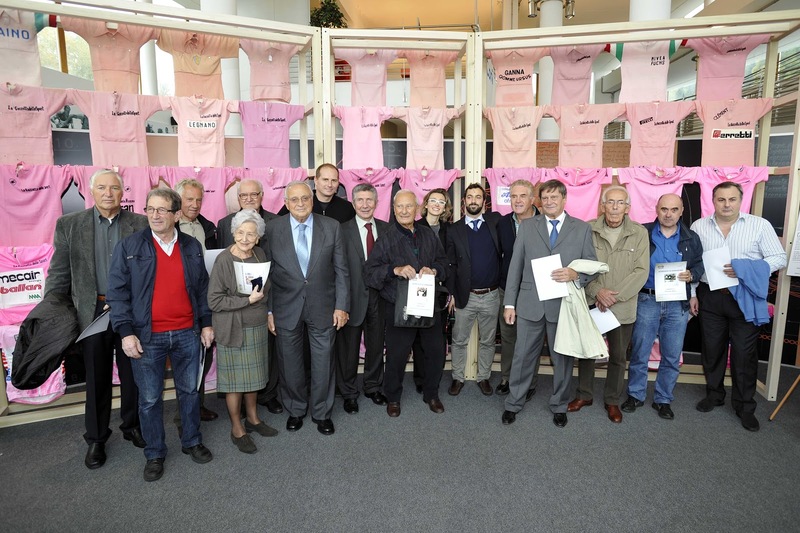 The Giro d'Italia has announced that the 2013 Maglia Rosa will be dedicated to Magni and that at the arrival of the race in Brescia on May 26 there will be a special ceremony. 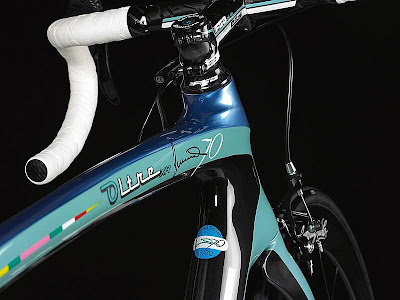 "Bianchi has developed a Special Edition Oltre XR model in celebration of Felice Gimondi's 70th Birthday. Only 70 units of this unique and exclusive Gimondi 70 bicycle will be produced; click on photo to enlarge. 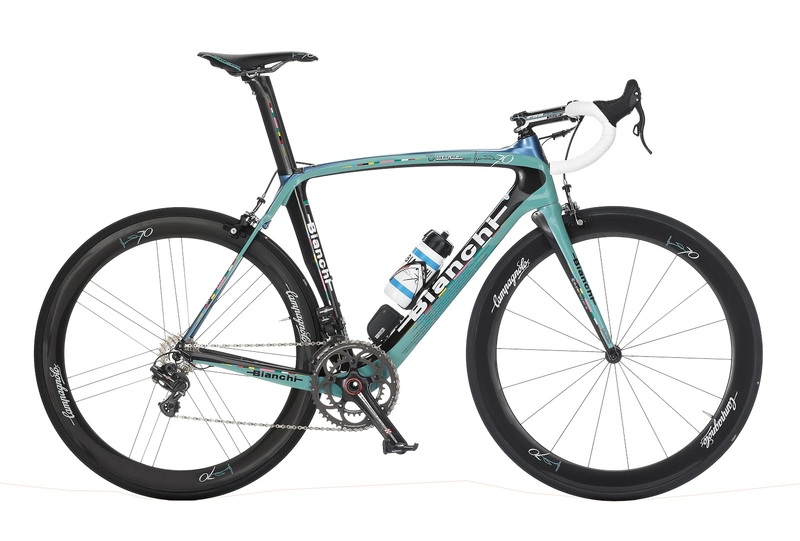 The 70 numbered units will be built and customized at Bianchi headquarter in Treviglio (Italy). - Celeste Bianchi color which matches up the blue of the Bianchi jersey worn by Felice Gimondi in the 60's and the blue of the Sapphire, the amulet stone distinguishing the people born in September. -Multicolour stripes along the tubes to remind us of Gimondi's leader jerseys of Giro d'Italia, Tour de France, Vuelta a Espana, World and Italian Championships. 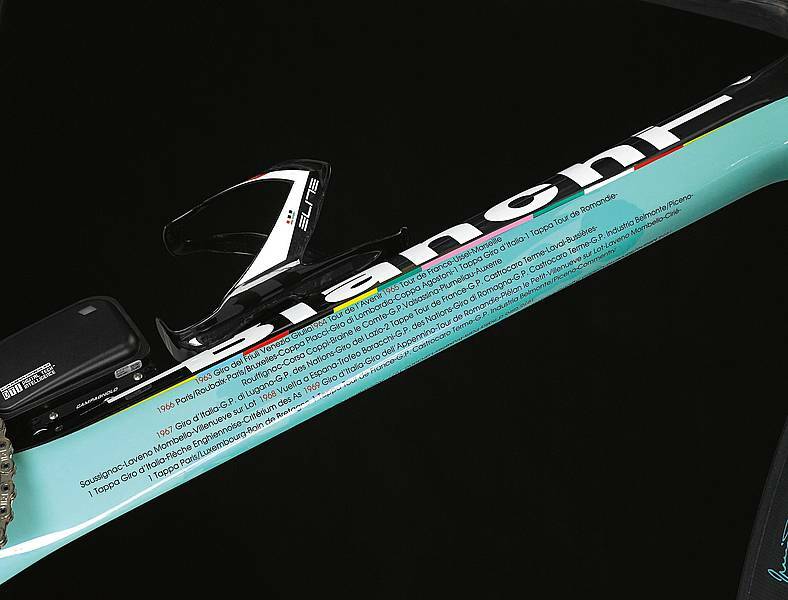 There will also be prepared a list of customized items (accessories) to include in the sales of the Gimondi 70 limited edition bike. Pricing and further information will be forthcoming." The first gran fondo in Rome, the GranFondo Campagnolo Roma, was a huge success attracting 5,500 riders from 20 countries on October 14th. The gran fondo coincided with a "car-free" day in Rome (electric cars were permitted). 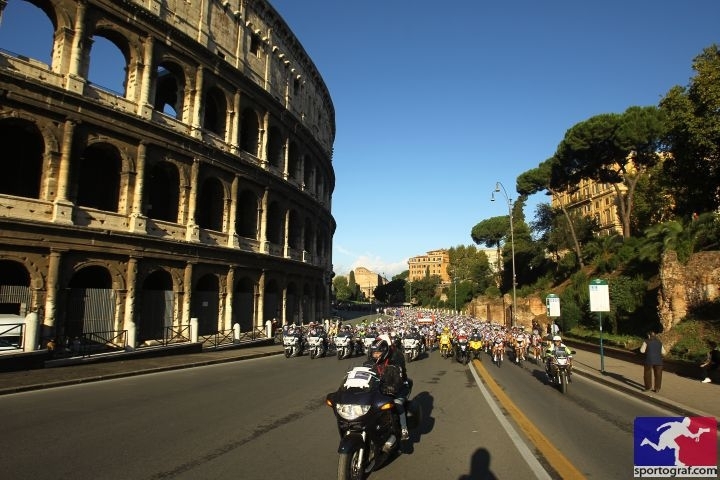 Riders started in Terme di Caracalla, passed through through the Rome city center, and continued on the Appia Antica to the hills of the Castelli Romani . 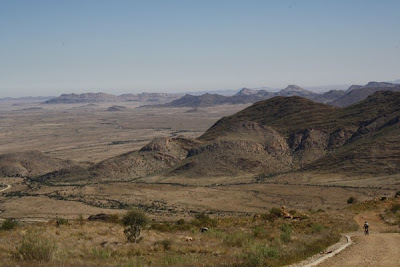 There were two routes, one of 91 kilometers and the other of 145 kilometers. For the first time in more than 65 years the number of bicycles sold in Italy surpassed the number of cars sold. Last year Italians bought 1,750,000 bicycles compared to 1,748,000 cars. That's not the most bicycles sold in Italy, 1,927,600 were sold in 2009, but with Italians buying cars at rates from the 1970s the tipping point was reached. With a financial crisis, and the extremely high cost for gasoline, there has been an ongoing shift towards the use of bicycles in Italy. Out of a population of 60 million, 6.5 million Italians use a bike to get to work or school, while 10.5 million use them occasionally, mostly at weekends. 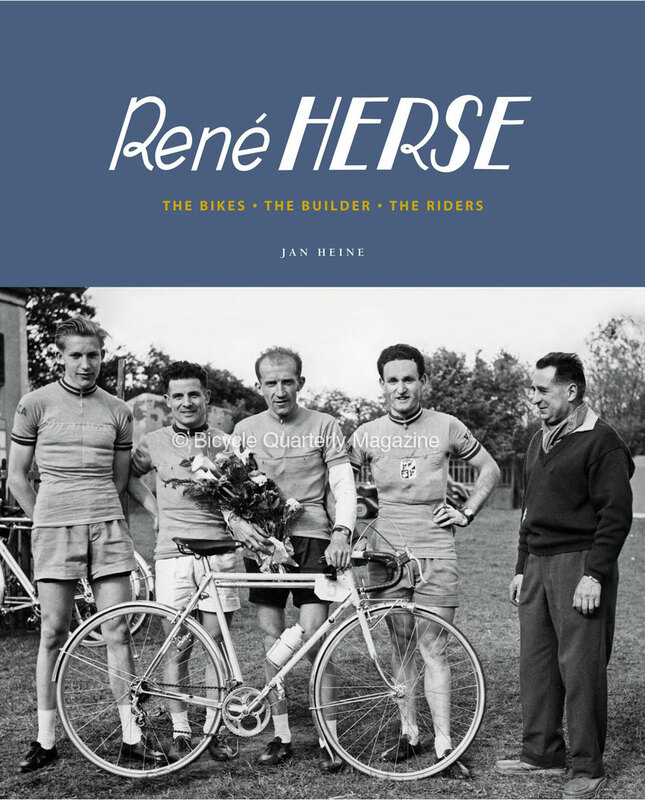 Every once in awhile we detour off Italian cycling into another subject area, this time to the announcement of a new 424 page book by Jan Heine about Rene Herse, the French framebuilder, his bikes, and his riders. For more information and additional photos, or to pre-order your copy, click here. The suitcases were full of photos. Not just hundreds, but thousands of photos. Not just snapshots; most were of excellent composition and quality, taken by professional photographers. As I looked through them, the whole history of Cycles René Herse began to unfold in front of my eyes. Here was a photo of René and Marcelle Herse as a young couple. 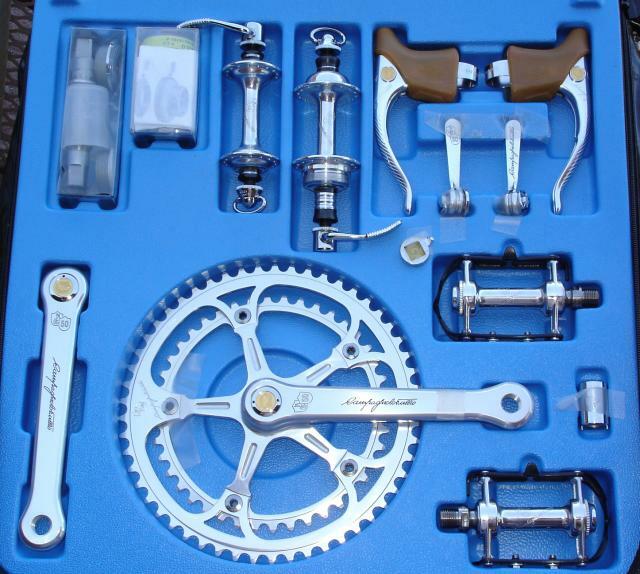 There was the first René Herse component, a pedal, and his first crankset; I knew the pedals only from a drawing in Herse’s advertisement in pre-war issues of Le Cycliste. 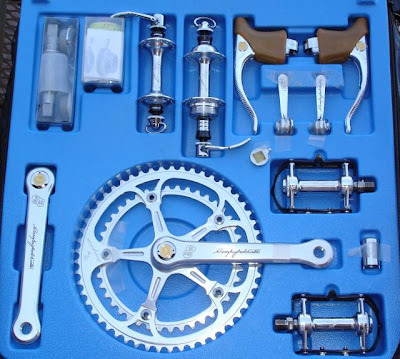 Herse had introduced his components at the 1938 Technical Trials, where he rode a bike made by Narcisse, but equipped with Herse’s own components. 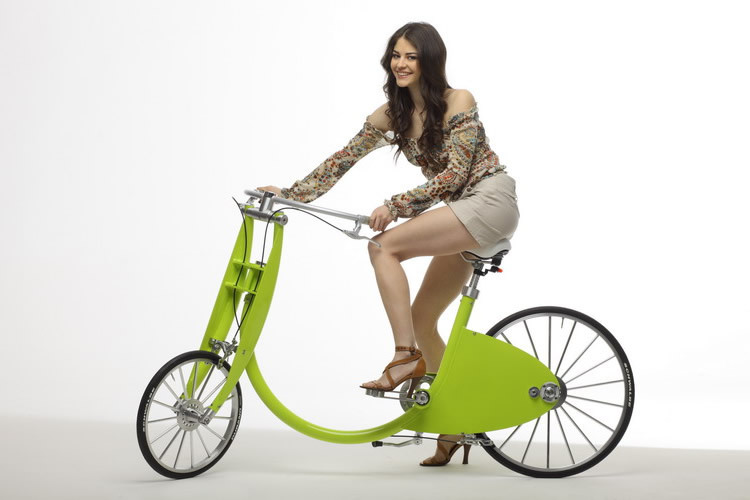 Contemporary reports explained that the bike was lighter than any bike before, but nobody knew any longer what that Narcisse bike looked like. In the suitcase was a photo of Herse at the Trials with his Narcisse! It’s the photo shown above. There were photos of war-time events that I had never heard about. I found many photos of Herse’s daughter Lyli with various captains winning the tandem category of almost a dozen Poly de Chanteloup hillclimb races. Dramatic night-time images showed riders in Paris-Brest-Paris. Others featured Herse with his team at the finish of competitive events. There was Lyli in the United States, visiting customers and friends during the 1960s, when American orders helped to keep the shop afloat. The suitcases contained autographed photos from famous racers thanking René Herse for his assistance. Could they corroborate the stories that many champions had ridden on frames that had been made by Herse? It was a treasure trove of previously unseen materials. Some of the photos were inscribed on the back in Marcelle Herse’s neat handwriting, but most lacked identification. During my research, I was fortunate to speak with many of the old “Pilotes de Herse” who are still alive. Those discussions and their rides have left indelible memories. Gilbert Bulté took on the task of identifying many events and riders. Paulette Porthault, “the Aunt”, who had known Herse from the earliest days, told us about riders and events that we never had even had heard about, like the war-time technical trials. Women who raced on Lyli Herse’s team in the 1970s filled in other parts of the story. It took half a decade of detective work to piece together this entire history, and by the end, I could recognize some riders like Lyli Herse even if their faces were obscured, just by their way of sitting on the bike. Many company records of Cycles René Herse survive, which helped establish the history of the company, and allowed me to corroborate riders’ and employees’ reminiscences. From the moment we opened those suitcases, I knew that these archives had to be shared with the world in a new book. The stories from the riders are even richer. As we did our research, one rider after another shared their photo albums to complete the story. For example, Daniel and Madeleine Provot provided the wonderful images of touring during the 1950s (above). As part of this research, we recorded many wonderful stories that otherwise would have been forgotten. Together with the photos, these memories tell a wonderful story of a time when cyclotouring was not just a hobby, but a way of life. To illustrate the talent of René Herse, we set up photo studios in France, Japan and the U.S. to photograph 20 amazing, original René Herse bikes. The bikes span the entire history of Cycles René Herse, from early machines made during World War II to the last bikes made after Herse’s death in the 1980s. They include rarities like an unridden “New Old Stock” machine from 1945 and a track bike that was ridden to half a dozen French championships. The result is our new book René Herse: the Bikes, the Builder, the Riders. Compressing a history as rich and varied as that of this prolific builder into a single book was a challenge. Rather than cut the book to a predetermined length and leave out wonderful images and anecdotes, we decided to give this story the space it needed. The book comprises 424 pages and includes more than 450 illustrations – it is the same size but more than twice as thick as The Golden Age of Handbuilt Bicycles. By focusing on the riders who enjoyed cycling in the company of good friends, I hope this book will inspire future generations of cyclists. The book is being printed now, and will be available in November or early December 2012.
addendum: Jan Heine wrote "It's interesting that in France, bikes with the lower third of the fork blades chrome-plated and the rear ends as well (1/3 of seat and chainstays) were called "à l'Italienne" or "Italian style." Similarly, smooth lugs without the scallop, as seen on many later Herse racing bikes, were called "Italian-style lugs". A big thank you to pezcyclingnews.com for permission to use this report from Interbike. Sarto frames are made in the Veneto region. For a couple of years now, I’ve mentioned Italy’s Sarto Cycles as one of the brands that North America have seen a lot of without knowing what they’re seeing. 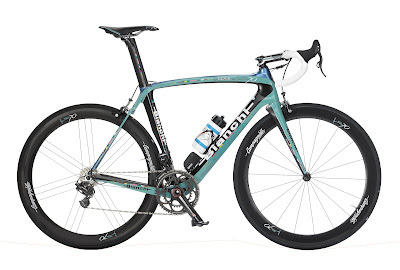 Part of the reason Sarto manage to supply custom bikes for teams sponsored by large, non-custom carbon manufacturers is down to their ability to spec not only geometry, but to actually produce tubes to specification. And that specification includes not only wall thickness and stiffness, but the bigger difference in being able to play with shape. It’s that shape shifting ability that allows them to produce custom versions of bikes that usually have special shapes that typically come from molds. One of the challenges they’ll have as a company is in deciding which tubes to offer through select retailers for North America, as it’s simply impossible to effectively sort through the hundred plus shapes they can provide. Their dealers can literally specify every section of the bike. The picture above is a zoom in of leaked picture of what was supposed to be a notable frame, but what stands out is that a clever man inside is working on options to smooth out the road by designing different suspension rails. (word is that this is the hand work of someone whose name rhymes with “Antonio”). New developments make sense as Sarto are in process of a factory upgrade that will have them adding equipment more frequently associated with F-1 teams than bike builders, so we’re staying tuned here. 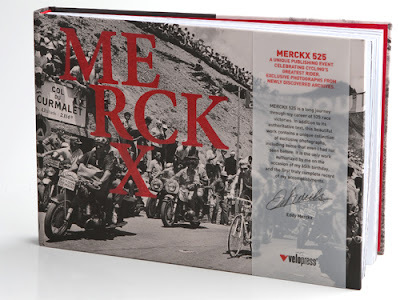 Boulder, CO, USA - October 10, 2012 - VeloPress, the leading publisher of books for cyclists, is pleased to announce the publication of Merckx 525, the first biography authorized by Eddy Merckx himself and the first he says is a truly complete record of his career. Revealing a dazzling trove of recently discovered photographs not yet seen outside of Europe, Merckx 525 is an all-encompassing celebration of the unmatchable career of the Cannibal, Eddy Merckx, the greatest cyclist of all time and the most dominant athlete of the 20th century. This spectacular coffee table book is now available in bookstores, bike shops, and online. Preview Merckx 525 at www.velopress.com/merckx. Known as "the Cannibal" for his insatiable hunger to win, Merckx gobbled up 525 race victories, an unrivaled legacy lionized in this once-in-a-lifetime homage. Merckx 525 presents newly restored photographs from private collections, the Merckx family, and European newspaper archives, shedding new light on this awe-inspiring athlete's career from promising youth in Belgium, to fabulous darling of Europe, to hardened veteran of the bike-racing wars. With authoritative text and keepsake craftsmanship, Merckx 525 digs deeper than any book before to reveal the man behind the legend, cycling's incomparable Eddy Merckx. Hardcover with 126 full-color photographs throughout. 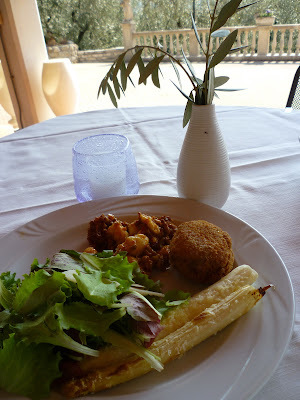 My thanks to Kathy Bechtel of Italiaoutdoors Food and Wine (www.italiaoutdoorsfoodandwine.com) for writing in with a story from one of her trips. 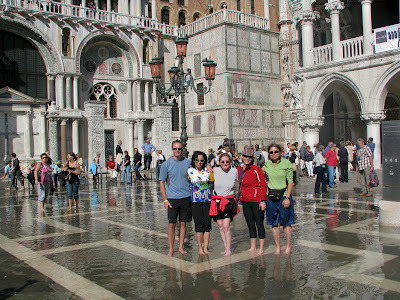 Italiaoutdoors Food and Wine specializes in active vacations complemented by a focus on food, wine, culture and history. 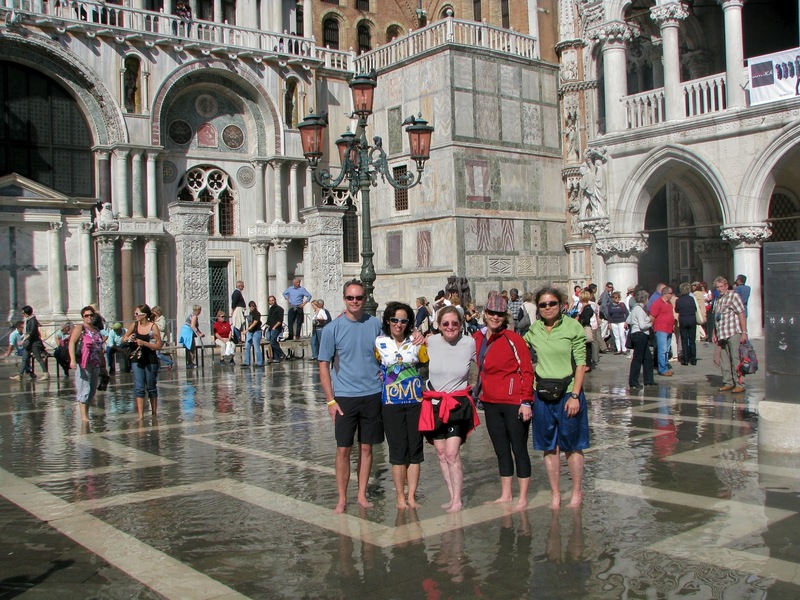 "Think of the northeast of Italy, and most tourists think of Venice - one of the most romantic cities in Europe, with its gondolas, villas, and Piazza San Marco, surrounded by the waters of the Adriatic. Not a spot usually considered for cycling, but the Lido di Venezia, just a short ferry ride away, is a great place to explore by bike. 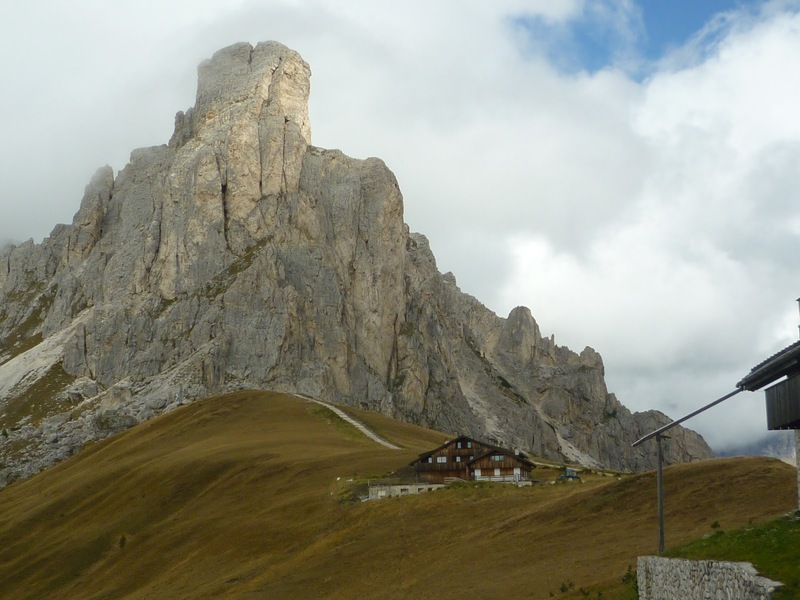 Expert cyclists may think of the majestic Dolomites, the magnificent peaks north of Venice, home to some of the most challenging climbs in the world. But cyclists of all levels will find terrain to their liking here in the Veneto. 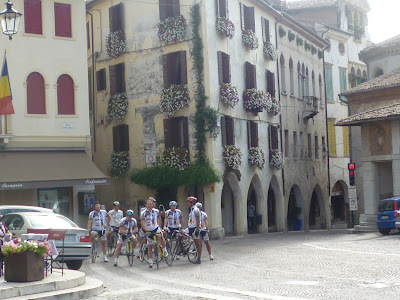 From flatter rides along the Brenta canal, riding by Palladian villas built for the Venetian aristocracy, to the foothills where we can visit picturesque walled cities and a different wine zone each day, to the most famous climbs on the Giro d’Italia, there is something for every cyclist to enjoy. But don’t take our word for it - come check out the roads here on a beautiful Sunday afternoon, as we recently did - riding about 40km inland of Venice, with a view of the Alps to our north as we cycle from Castelfranco Veneto, to Asolo and onto Bassano del Grappa. Throughout the day we are joined by literally hundreds of local cyclists out for a wonderful afternoon of riding, enjoying the scenery, and a stop or two for a prosecco and a snack. Just our style! 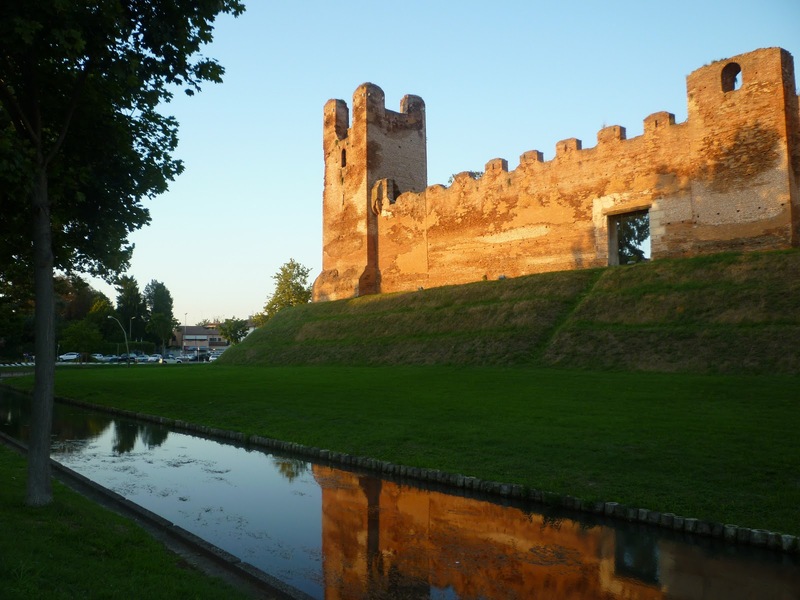 We began the day in Castelfranco Veneto, originally a castle built in the 13th century. Portions of the medieval walls and towers still stand today. The famous painter Giorgione was born here, and the cathedral contains one of his most renowned works, called ‘La Pala’. There are several excellent restaurants to enjoy on a visit here, but my favorite is Antico Girone; not only due to its tasty local dishes and exceptional wine list, but they’ve also been kind enough to feed a couple of our hungry cyclists who were looking for some pasta during the hours of riposo, when most restaurants, including them, were closed! Today we head first to Asolo. A hilltop town known as “The Pearl of Treviso” and also as “The City of a Hundred Horizons”, it is one of the most beautiful towns in Italy. The former Queen of Cyprus ruled here in the late 1400s, and later famous residents included the poet Robert Browning. 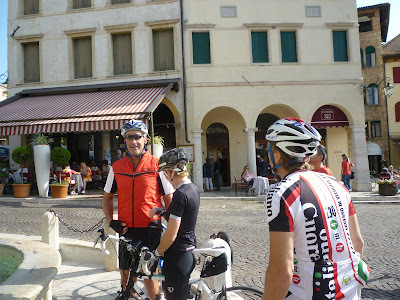 It is a brief climb up to Asolo, but all take their time, and are well rewarded when they reach the top. Asolo is a town well-known to cyclists, I viewed the Giro d’Italia as it flew by on the narrow streets of this town in 2010. Here, we blend in with the locals. On this spectacular Sunday, we mingle with the crowds of native cyclists - bikes vastly outnumber cars here - as we stop for a quick snack at a local cafe. Next, we are off to Bassano del Grappa. Originally the town was known as Bassano Veneto. The town is famous for the renowned Italian digestif, grappa, with two well-known producers located here - Poli and Nardini. 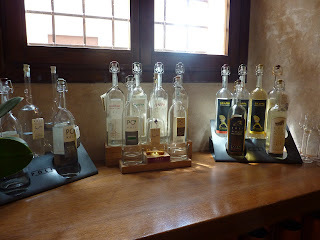 It is commonly believed that the spirit was named after the town, but the town itself was not called Bassano del Grappa until 1928, long after the spirit was invented. Bassano was located right on the front line in both World Wars. During the first World War, terrible battles ensued on neighboring Monte Grappa, where the Italian army regrouped after their devastating loss at Caporetto and made a heroic last stand against the Austrians. At the top of the mountain lie the remains of over 12,000 Italian troops and over 10,000 Austrian and Hungarian troops who lost their lives during this battle. In 1928, the name was changed to Bassano del Grappa, in memory of the soldiers killed. Hemingway fans may recall the role this town played in his novel A Farewell to Arms. Cyclists who want a real challenge can take a detour and visit the summit of Monte Grappa, also a route known to fans of the Giro d’Italia. Here, there are numerous options for the ascent that we can guide you to, from one that reaches a 10% grade max to as much as 20%. Those who wish to stay on flatter terrain can take their time on a more circuitous route, and spend some time in Bassano visiting the beautiful Ponte degli Alpini - the lovely pontoon bridge designed by famed architect Palladio. All of our riders can meet up in Bassano to enjoy a wonderful lunch, followed by a tasting of the local grappas at Poli. 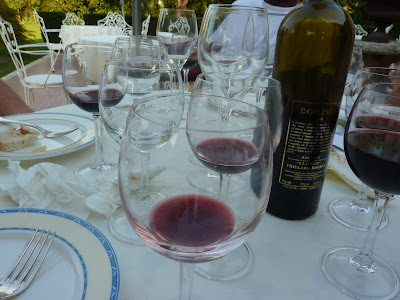 As the chef and wine lover of our guiding team, my passion is the foods and wines we see along the way. Wonderful seasonal produce grows all around Bassano del Grappa, from grapes for the local wines - we are in the Breganze and Vicenza DOC regions now - to olive oil, cherries, beets, and radicchio. 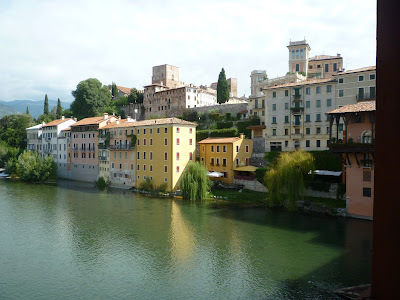 On a recent culinary and biking trip in spring, we were lucky enough to visit Bassano during asparagus season. Bassano is home to one of the rarest delicacies in Italy, its white asparagus that appears between mid-March and mid-June. In the 1500 and 1600s, it was reserved for the banquets of the Venetian nobility. Today, it is still not exported outside of the region. We got a rare chance to cook with it during one of our afternoon cooking classes. So if you are in Bassano during the spring, make sure your post-ride pasta is fettucine with asparagus! We can end our travels here in Bassano, with the afternoon to explore, or continue on to Marostica, or even Vicenza. This area supplies so many different ride options, we are never at a loss to find the perfect route or routes for a group! And with foods from the fish of the Adriatic to the mountain cuisine of the Dolomites, and over 30 different wine regions to explore, this is probably the most versatile and fascinating region in all of Italy." How Fast Can You Go Up the Muro di Sormano?